SA Power Networks will shortly begin the work of trimming, cutting and maybe even destroying all of the trees marked below. 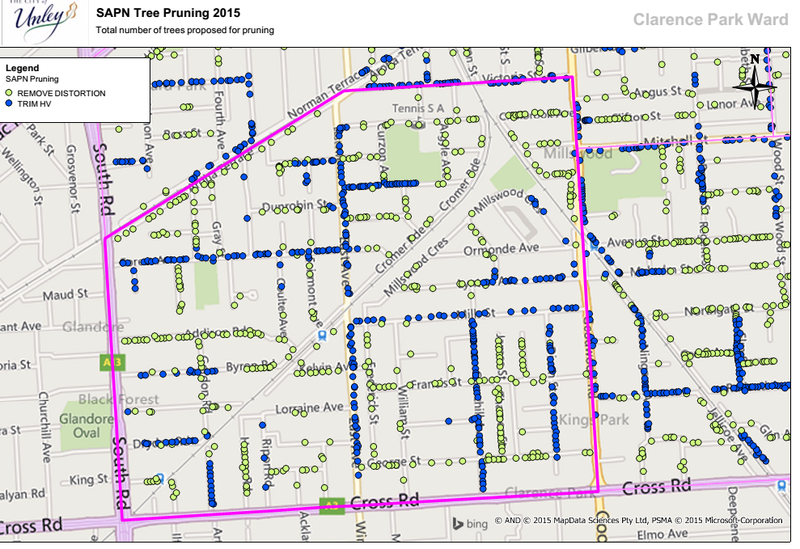 While you will receive a letter from the Mayor about this the reality is that SAPN intends to work on each of the shown trees. Council arborists will work with SAPN to try to ensure the minimum damage. My concern is that SAPN does not employ arborists or tree surgeons to do this work. The contractors will remove the necessary growth as quickly as they can as they are being paid per tree. The first you will know that your street has been targeted is when you see them in the street or even when you get home from work and the damage has been cone. It is important to note that SAPN are doing this work and Council has little or no influence on them. Become a Bicycle User Group (BUG) member!